Climate change - Solar System Planets And Moons Section. Climate change is still very controversial. Climate change is still controversial, and many scientists are skeptical. Global warming Tied to Decreasing Earthshine. 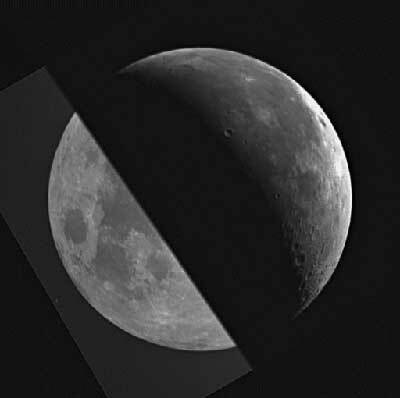 Astronomers can measure the reflectivity of the Earth's atmosphere by watching "Earthshine" on the Moon. They found that a gradual dimming of this light from Earth reflected against the Moon matches the warming of the planet's lower atmosphere over the last two decades. The possibility that decreased cloud cover could cause Climate change is still controversial, and many scientists are skeptical about this new research. Interestingly, the Astronomers who produced this recent study have found that the trend is reversing, with Earthshine increasing again. Star Production is Still High in our Galaxy. It seems that our Milky Way is producing stars much more rapidly than previously predicted by many astronomers. This is according to new research supported by NASA's Spitzer Space Telescope, which was focused on Nebula RCW49. In visible light, there isn't much to see because its heart is shrouded in dust, but in the Infrared spectrum, which largely ignores the blocking effect of the dust, Astronomers have spotted more than 300 proto-stars in this stellar nursery. And there are many regions like this throughout our galaxy; and probably all galaxies. Saturn From Hubble Space Telescope and Cassini. As Saturn grows larger in Cassini's camera, scientists have turned many instruments on the ringed planet, including the Hubble Space Telescope. This latest release from Hubble matches up a photo of Saturn taken by the great observatory on May 22 with one taken by Cassini on May 16. It's only Hubble's incredible optics that give it a similar view to Saturn, but that's about to end as Cassini is now only a month away from its destination. The colour differences between the images are due to the different filters used on Hubble and Cassini. Today's image released by NASA, and taken by its Cassini spacecraft is a close up view of Saturn's rings, and several of its moons: Mimas, Epimetheus, and Enceladus. The image was taken on May 10 with Cassini's narrow angle camera when the spacecraft was 27.1 million kilometres away (16.8 million miles).